Mona Vale at Ocean Thunder 3 – photo by Jason McCawley. 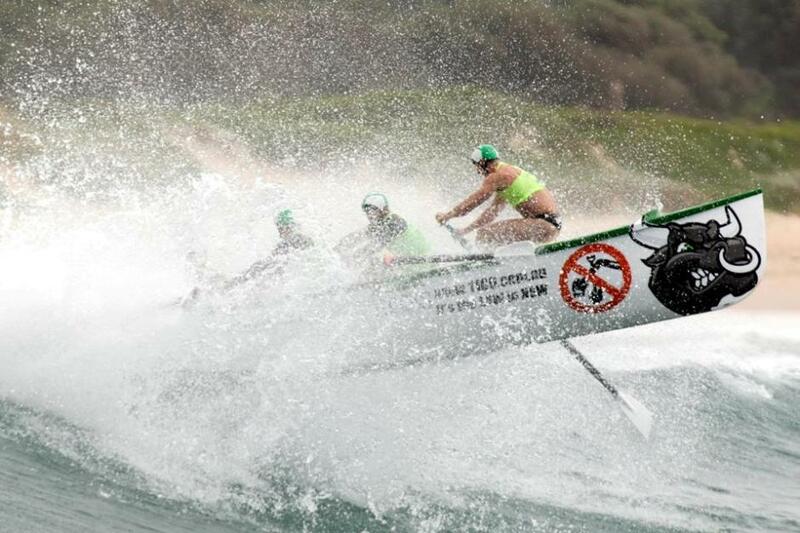 Since before Christmas Mona Vale SLSC's Open Mens and Womens crews have been taking 1sts all over the place. On December 20th, 2015 the Mona Vale 'Dial Before you Dig' crew of David Schumacher, James Bezer and Jaxon Rudduck, Trent Rogers and Sweep Matt Collins were selected as the 2016 Australian representatives in the Trans -Tasman. 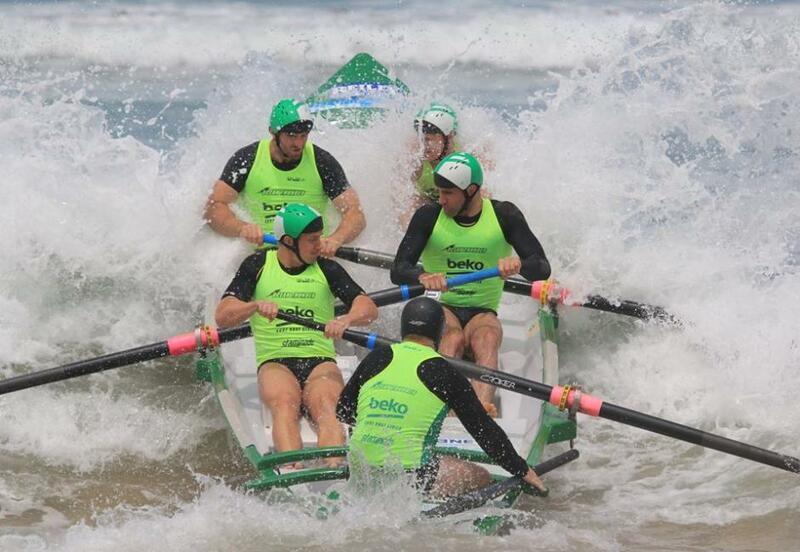 Each year Surf Life Saving Australia and Surf Life Saving New Zealand select an open men’s and open women’s surf boat crew to represent each country respectively to compete in the annual Trans -Tasman Surf Boat Test Series. This year’s event will be held as part of the ASRL Open on Saturday February 20th at Shellharbour. Two weeks ago, January 9, 2016, Mona Vale competed in Round 3 of the 2015/16 Ocean Thunder Surfboat Series held at Dee Why Beach, with the Dial Before You Dig crew taking 1st and 2nd being won by Boat Captain and Sweep Ryan Halangahu's Mona Vale Rocks Open Men's crew. The Mona Vale ladies, the Kone Elevator Open woman's crew, placed 3rd. Current Ocean Thunder titleholders Currumbin placed fourth in the final, their lead reduced to just one point from the 'Dial Before you Dig' crew with the final round to be decided at Dee Why on February 6. Matthew Collins is the gentleman who, along with Kim Marsh, has been running Sweeps School and rowing schools all over the country since 2003. 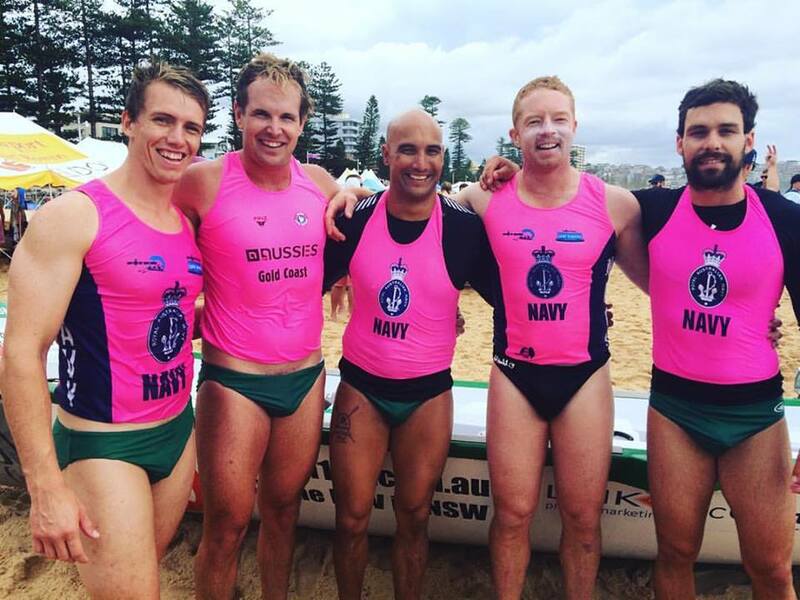 Yesterday, Saturday January 23rd 2016, the Mona Vale Big Macs, Chris Reid, Mathew Chave, Ryan Halangahu, Samuel Wallrock and Nick Ellis,.won the Open Men at the Team Navy ASRL Manly Open! Palm Beach SLSC took 2nd and 3rd was claimed by Queenscliff. Today is also a pretty big day for Mona Vale SLSC with the 39th Don Jenkin Memorial Swim commencing from 10 a.m. from Warriewood Becah and finishing at Mona Vale. Those who haven't entered and want to be a part of this second last swim for the Pittwater Swim Series need to get to Warriewood to register from 8.30 a.m. and by 9.45 a.m.
Congratulations to the Open Women from North Cottesloe SLSC Westerfeld Engineering who won the Open Women final at Manly this year with South Curl Curl 2nd and Elouera in 3rd. Avalon Beach SLSC's Pinkies Under 23 men qualified 1st for the NSW State Team at the Manly Carnival, the final NSW State Team Selection Event, and 1st for the Australian under 23 development team. Conditions at Manly were challenging leading organisers to cancel the Under 19 and Under 23 womens rows. Bilgola's beautiful Carol McManus boat sustained some serious damage, as did the sweeps oar - some indication of how difficult getting out, and then getting back in was. Fortunately everyone was ok.
Last Sunday Avalon Beach SLSC launched a new surfboat, named for Daryl Johnson, one of the club's long service members and long term boatie. He was in the old boys Masters crew last year and part of the crew who won the Club’s first national surfboat championships in 1993 with Rick Millar, Michael Heathcote, Brent Walker, and Nathan Press in 1993 at Kurrawa. Avalon Beach SLSC's Ocean Swim 2016 is the Pictorial for Issue 248 celebrating that Summer is Surf Life Saving Club peak season and a great time to dive into one of the remaining Pittwater Ocean Swims.